Bureaucratic work is understandably boring but it has its perks: a steady income and a stable job. However, nineteen government employees in China's far west province of Xinjiang have taken their jobs for granted, spending their office hours playing video games. The government employees were caught in late august after unannounced inspections by the local government's disciplinary arm. During both visits, the inspectors found a decline in work efficiency from the Manas county Industrial Park regulatory department as well as declines in fourteen other departments. Manas county is located in the Xinjiang Uyghur Autonomous Region in West China. This region is often wrought with political and social turmoil. Much of the area is still closed to foreign journalists and tourists. 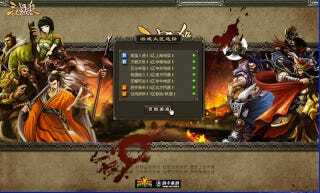 Looking into what caused the lack of work production, the disciplinary department found that 19 employees spread across 14 local government departments, most from the IPRD, were playing Three Kingdoms Killers Online, the Bang!-inspired, Three Kingdoms-themed card game. Of the ninteteen people that were caught playing video games during office hours, four included deputy department heads, and ten were township level supervisors. So far, there is no word on what their punishment will be, but from the looks of it they could have just lost their careers all for the sake of gaming at work. Hope it was worth it!